At Richardson Podiatry Center, the goal is always to treat your foot or ankle issue with the use of nonsurgical methods. Whether or not this is possible—or if surgery is needed—depends, of course, on the nature of your injury, but there are many options that can be used in a conservative treatment plan. One of the more versatile tools Dr. Reister might use to restore your feet back to health is custom orthotics, and these helpful devices might just be the answer for your foot or ankle issue. Also known as orthoses, these are shoe inserts created specifically for your unique feet, as opposed to off-the-shelf shoe inserts you can pick up at retail stores. They are intended to correct a medical condition causing you pain or interfering with your ability to do the activities you enjoy doing. Custom orthotics are created in various sizes and shapes, and from a variety of materials, in order to achieve any of several different objectives. Typically, orthoses are used to protect feet from injury, correct abnormal biomechanics, or combine protective function with motion control. Soft orthotics are generally prescribed to alleviate pressure on sore or uncomfortable areas, absorb shock, and/or increase your balance. Diabetic, deformed, and arthritic foot conditions benefit from these particular types of orthotic devices. In order to provide superior cushioning, these custom orthotic devices are constructed with soft materials and may run along the length of the entire foot. Whereas soft orthotics are intended to decrease pressure and protect the foot, rigid ones are used to control or restrict abnormal biomechanical processes. Often used for a patient’s walking or dress shoes, this type of device has to be solidly constructed to offer the structure necessary for regulating movement. Rigid orthotics are typically made with firm materials like plastic and carbon fiber and serve to help with alleviating or eliminating pain, aches, and strains in feet, ankles, legs, or lower back. When you need the cushioning benefits of soft orthotics with the motion-controlling aspects of rigid ones, Dr. Reister may prescribe a semi-rigid version. These are excellent for sports and other physical activities, especially for athletes who experience pain while competing or training for their respective sports. Usually, a semi-rigid orthotic device will be constructed using layers of soft materials and reinforced with rigid ones to provide structure and improve foot balance. In addition to athletes, children who have issues that relate to flatfoot, in-toeing, or out-toeing can also benefit from this style. What Issues Can Custom Orthotics Help Treat? Flat feet. This structural abnormality does not typically cause pain on its own, but it can cause overpronation. Pronation is a normal process of rotation in your feet, but excessive rolling leads to ankle, knee, hip, and back pain. 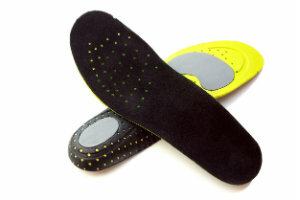 Custom orthotics help reduce the pronation by controlling your feet’s motion. High arches. Foot arches that are too high also create problems, but orthotics can help them as well. If your feet supinate (do not roll enough), the extra pressure applied to the outer edges can lead to painful conditions. Fortunately, orthotics can be used to correct this condition and resolve any related issues. Plantar fasciitis. This condition is marked by a sharp, stabbing heel pain that comes with the first steps of the day. It is caused by tiny tears that happen on account of tension on your plantar fascia. Orthotic devices can offer the necessary arch support to prevent this from happening. Neuromas. Excessive pressure from surrounding tissue onto a nerve—especially in the front of the foot—can cause burning sensations, numbness, and even pain. You may be prescribed certain kinds orthotics to treat this condition. Richardson Podiatry Center is ready to help you with any foot or ankle condition causing you pain or difficulty. Custom orthotics might be the nonsurgical treatment option that works for you, so let Dr. Reister create a pair for you. Start your path to pain-free living by calling (972) 690-5374 to request an appointment at our Richardson, TX foot doctor office. You can also use our online form to connect with us today!